I usually don't update my maps during storms, but it is obvious to me (based on observations/radar trends) that there are going to be some areas that exceed my final call. 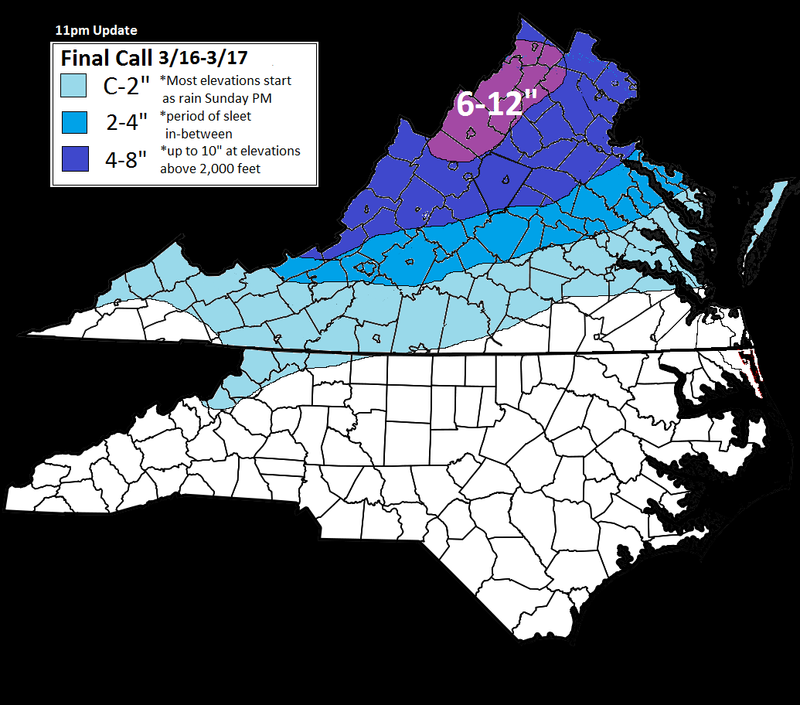 I extended the 4-8 all the way to the VA/MD border and added an area of 6-12". The dry air that I thought would help limit totals across northern VA simply isn't limiting the advancement of heavier bands. The rest of my initial final call stands. 1) Rain spreads from southwest to northeast across the area this afternoon. It will quickly change over to a mix and then snow from northwest to southeast through the evening. The higher elevations will be quickest with the changeover. 2) In the Shenandoah Valley, heaviest snows will fall from 10pm Sunday to 4am Monday. The surrounding ridge tops of the Allegheny and Blue Ridge mountains will likely receive the heaviest totals. 3) In southwest Virginia, there is going to be a pretty sharp cutoff from north to south with snow totals. A dry slot will work in, allowing best lift to shift north of Blacksburg and Roanoke. This will allow precipitation to become lighter and potentially transition to more sleet/freezing drizzle/light snow mix during the overnight hours. 4) Across the greater Richmond area, I think borderline temperatures, compaction, along with recent warm temperatures help hold accumulations down. I also think they struggle to stay all snow. Models have been showing higher amounts across this area, but just have a hard time buying it. 5) There's been a lot of waffling in regards to how much precipitation gets into the far northern VA area (Winchester/DC). The gfs has been wanting to take the 4-8 line all the way to the VA/Maryland border, while the nam is a good bit farther south. I felt like taking the middle ground here was the best idea. 6) There could be some light areas of freezing drizzle/snow flurries/sleet that persist into the evening hours on Monday, particularly along and east of the Blue Ridge mountains and into the piedmont. Below are my thoughts on when rain will change to wintry weather. The changeover setup is pretty complicated so this is a low-confidence map.